S/H Alumni were honored by the Louisiana High School Athletic Association (LHSAA) for their outstanding academic achievements. The LHSAA/Exxon Mobil All-Academic Award Program presented by ISC recognizes the academic excellence of senior student-athletes who have achieved a 3.5 grade point average and higher on an unweighted scale by placing them on the Composite All-Academic Team, Class (5A) All-Academic Team, or Division (1) All-Academic Team. To earn composite team honors, a student-athlete’s six-semester GPA must be one of the 18 highest in all seven classifications. Composite Teams (all 4.0 students on an unweighted scale) were honored at LHSAA state championship events. The class and division teams are composed of student-athletes with a six-semester GPA of 3.5 – 3.9 (on an unweighted scale). Robert Christmann '13 and Robert Cerise '13 earned All-Academic Composite Team honors for cross country. Malcolm Sundell '13 was recognized for Cross Country -- Class 5A. John Thomas Holmes '13 was recognized for Golf -- Division 1. Andrew Ryan '13 was recognized for Tennis -- Division 1. Reese Leonhard '13 was recognized for Soccer -- Division 1. Matthew Frischhertz '13 was recognized for football -- Class 5A & Division 1. Christian Hess '13 was named to the 2018 NOLA.com | The Times-Picayune All Metro Baseball Team. The Blue Jay Parents’ Club Award for excellence in scholarship is awarded to the seniors who are graduating with the highest grade point average for four years at Jesuit High School. They are also named co-valedictorians of their class. This year, the award is merited by 5 seniors, including two of Stuart Hall's very own: Robert Christmann '13 and Samuel Guillory '13. The Frank T. Howard Memorial Award for excellence in English was merited by Robert Cerise '13. The Susan & Garic Schoen Award for excellence in computer studies was merited by Alex Petty '13. The Christopher Morgan Memorial Award for the cross-country letterman who has best exemplified courage, leadership, sportsmanship, and spirit is merited by Jordan Tufts '13. The Stanley Ray Award for the most improved track letterman for the current year is merited by Benton Moore '13. The Morris B. Redmann, Jr. Memorial Award for the outstanding senior football letterman who best combined scholarship and athletics is presented to Matthew Frischhertz '13. The Daniel “Rusty” Staub Memorial Award for the senior baseball letterman with the best sportsmanship, leadership, and spirit is merited by Christian Hess '13. The Excellence in Leadership Award is given to the NHS Senior member who has provided exemplary leadership to the chapter. This year the award is merited by John Thomas Holmes '13. The Excellence in Character Award is given to the member of the chapter who best models what it means to be “a man for others” inside and outside of the school. This year the award is merited by Robert Cerise '13. The Williams College Book Award was presented to Charles Korndorffer '14. The University Book Award is presented on the basis of academics, co-curricular activities, community service, and high character. These students evidenced sincere concern for others and made significant contributions to Jesuit High School outside the classroom. Congratulations and good luck to Stuart Hall's Class of 2013, who will be beginning their college adventure next year! 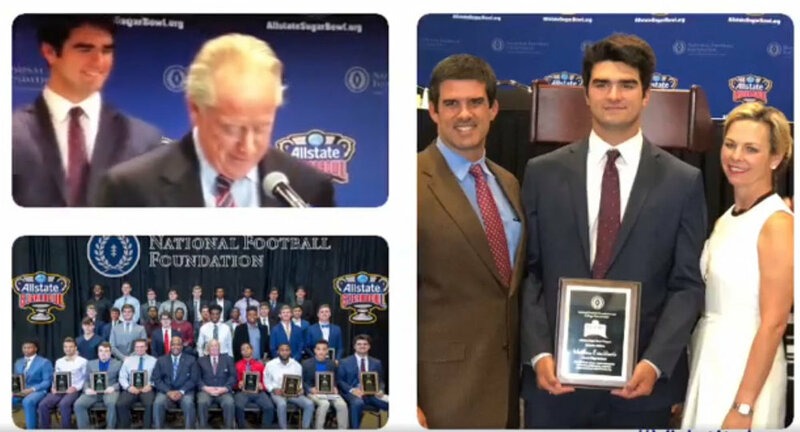 Congratulations to Matthew Frischhertz '13 on being named one of the 2018 National Football Foundation Scholar Athletes. He was recognized by Archie Manning at a recent awards ceremony. Read more about the prestigious award honoring scholar-athletes here. Congratulations again to our S/H Knights, who helped the Jesuit Blue Jays win the LHSAA Division 1 State Soccer Championship: Reese Leonhard '13, team manager Harrison Landry '13, and Tyler Mire '13. The Stuart Hall Round Table hosted a Halloween bake sale and crazy hat day to raise funds for Hams for Fams, which delivers food baskets for needy families during Christmas, "bringing joy one basket at a time." We are so proud to be able to support this effort, which is currently being spearheaded by two of our alumni Robert Cerise '13 and Robert Christmann '13 (pictured to the left). The organization was co-founded by two Jesuit alumni, who were recently named among Gambit's Top 40 Under 40, along with S/H alumni Cameron Pelitere '12 and Stephen Sepcich '12, who currently sit on the board of directors as executive aide and volunteer coordinator, respectively. S/H alumni who competed at the LHSAA Swimming State Championship included Charles Korndorffer '14, Connor Schwartz '14, Joel Guerra '15,Evan Ehresning '14, and Andrew Schwartz '14. Congratulations to Charles Korndorffer '14 on his fantastic showing at the LHSAA Swimming State Championship. Charles was named Swimmer of the Meet. He broke the state record in the 100-yard backstroke (49:72) and 100-yard butterfly (49:13). He was a member of the 200-yard medley relay team, which also broke a state record with a time of 1:34:74. Connor Schwartz '14, Joel Guerra '15, and Evan Ehrensing '14 all performed well in their respective races. Connor and Joel also competed on the 200-yard freestyle relay team, which placed first. Additionally, Connor joined Charles on the 400-yard freestyle relay team, which also placed first. Due to the inclement weather, track practice is cancelled today. Good luck to our Knights on their track meet this Saturday! Get your tuition raffle tickets today!